After her initial forays into standup garnered her some success, Allyson hit the comedy club circuit, which in turn propelled her to headlining gigs at festivals. She shone in multiple high-profile slots at the Winnipeg, Halifax and Montreal’s Just For Laughs festival. And that was just the start. In the years that followed she received multiple nominations for Best Female Stand-up at the Canadian Comedy Awards, taped her own Comedy Nowspecial and did stints on MuchMusic’s Video on Trial and CBC’s The Debaters. Now settled in the city of Manchester, UK, it’s time for Europe to reap the rewards of Allyson June Smith’s ever-inventive comedic ascent. A self-confessed “over-sharer”, any Allyson June Smith show inevitably serves up a potent observational cocktail of wit, bite and shame. Which means you’ll typically find her after the show, with a line of eager fans queued up to talk with her, to confess to her or to share some comically grisly detail from their own lives. Courageously self-deprecating, Allyson’s comedic gift is making every room, whatever the size, feel like an intimate group therapy session. That intimacy, that uncommon bond between audience and performer is at the heart of Allyson’s magic as a comedian. Like the most relatable actresses working today or your very best friend, she finds a way to connect with everyone in a room, be they from southeast Asia, the U.K. or North America. “Simply one of the funniest comedians I’ve ever worked with,” praised Jason Manford, following a string of support dates. 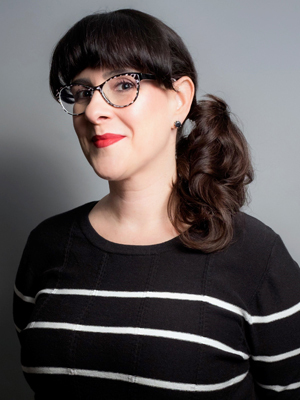 Other A-listers Allyson has been called to share the stage with include Katherine Ryan, Stewart Francis, John Bishop, Stephen Merchant, and Samantha Bee (The Daily Show). This Canadian comic might have disappointed her parents when she turned her back on teaching to become a stand-up comic – but sorry Dad, it was the comedy world’s turn to gain.